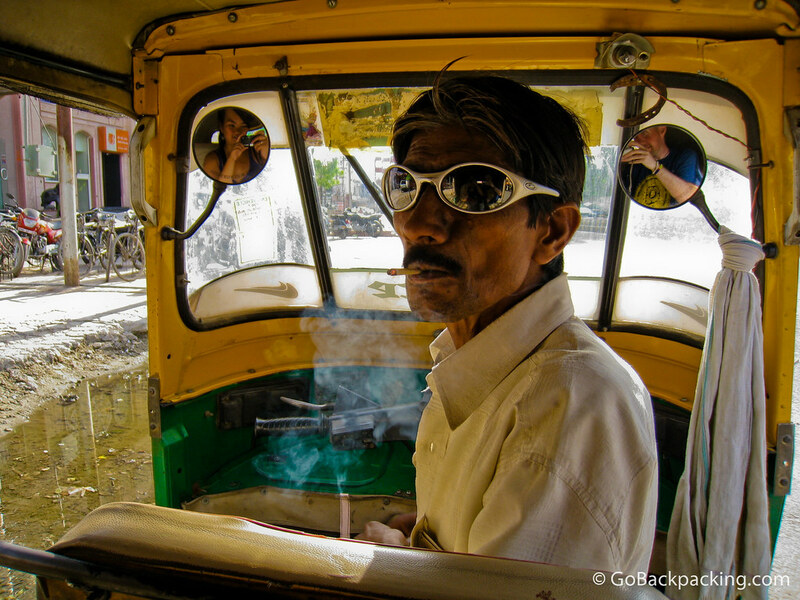 There's so much I like about this photo: the contrast of modern Oakley sunglasses with the old tuk-tuk, the reflections of me and Laura (from Paris) taking photos in the side mirrors, the cloud of cigarette smoke being exhaled, the sliver of crumbling road to the left. Sometimes a prop makes all the difference, as was the case when I handed our tuk-tuk driver in Agra, India my Oakley sunglasses. Thanks Leslie — I think it sums up the quirkiness of travel in India! Excellent photo! The reflections gives it a great playfull touch. love the pic. this guy is badass. What an awesome picture! I love the thick smoke. Feels very James Dean a la India. really a creative and awesome capture………..
Love the glasses! And the smoke, haha. really a good capture.The creativity of the capture is awesome. Agreed, especially when they take customers on a detour to a souvenir shop.